As you would know, this polish was released last year as part of the whole Alice in Wonderland collection. What you probably don't know is that the actress Mia Wasikowska, who played Alice is from my home town, Canberra. In fact she even went to the same high school as me. Except I was at school there about the time she was born - tee hee, now I'm showing my age!! Anyway, Absolutely Alice is glitter polish perfection. 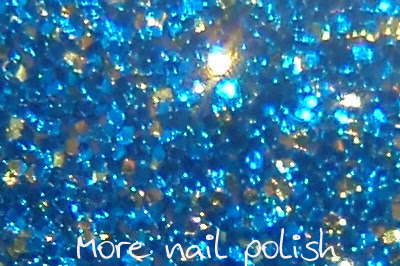 It's almost all blue micro glitter, but with enough gold glitter in there to catch the sun and glint in your eye. I love that this glitter was so dense that two coats gives 100% coverage. This is the only polish I got from the collection. I was wondering about getting Mad as a Hatter. What do you think? I die. *thud* That is gorgeous. I have seen Mad as a Hatter going for over seventy dollars on Amazon. I doubt I will be buying it, anytime, soon. 0_o I am lemming this hard now. I have the Alice in Wonderland Minis and I love the whole collection - so much that I was excited when I found AA full size on Nailetc.com! If you can find it for a reasonable price, definitely get Mad as a Hatter - I think these 2 glitters are so much nicer than the Burlesque ones. Update - I just bought Mad as a Hatter off ebay. On US ebay they have two listed one for $36 and the other for $46 (including postage)!! I just grabbed one for $16 (including postage) from an Australia seller, which is cheaper than David Jone retail. 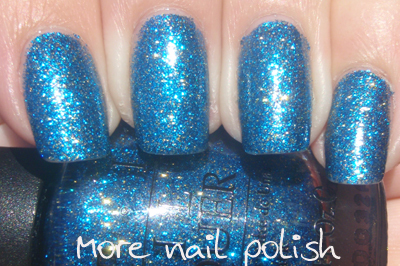 Yay - I did some googling for comparisons between it and sparkle-icious, and I think Mad as a Hatter looks much prettier. There goes my no-buy! pretty!!! i love the blue!